You have to respect the huge ambition behind Husbands and Sons, Marianne Elliott and Ben Power’s adaptation of three DH Lawrence plays which sees each of them run simultaneously in the round in the Dorfman. It manages this by taking the Holroyds from The Widowing of Mrs Holroyd, the Gascoignes from The Daughter-in-Law and the Lamberts from A Collier’s Friday Night and imagining them living on the same street in the East Midlands village of Eastwood. And spread over three weeks in October 1911, the interlocked, if not intersecting, dramas of their lives play out, dominated by the long shadow of the pit. Initially it’s a dizzying affair, as the eye and the ear deals with the three separate domestic establishments. Bunny Christie’s design takes a visual cue from the Lars von Trier film Dogville with the fully furnished houses demarcated by white lines on the floor and labelled by name, doors (and coats, weirdly) are mimed with accompanying sound effects. And with a nod to the fixedness of this arrangement, ticket-holders in the pit swap seats at the interval, getting to sit in the corresponding place on the other side of the auditorium, offering an alternative perspective on the goings-on. It may seem like a lot of fussiness but for me it worked beautifully, what the collage effect of bringing these three plays together like this may lose in the detail of the individual works, it surely gains in this creation of a real sense of community. Even if the characters never really formally interact, the intimacy of village life is brought beautifully to life – the looks across the room as the screams and shouts of a domestic echo down the lane, the secret small act of kindness from one mother to another, the physical support needed to roll back home from a boozy night at the local. And of course, the way in which coal mining overshadows all of their lives. The majority of the men of each household, the husbands, the sons, are miners and the hardship of their families’ lives in what interests Lawrence the most, placing the wives (and daughters and mothers) at the heart of each story. 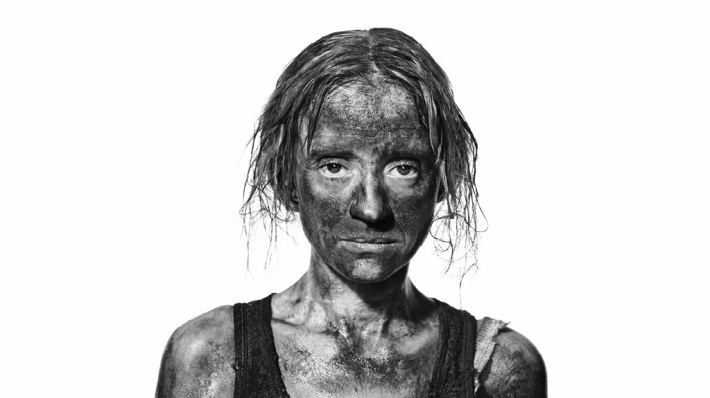 This is what Elliott and Power do too, Anne-Marie Duff’s Lizzie Holroyd, Julia Ford’s Lydia Lambert and Louise Brealey’s Minnie Gascoigne each become focal points, not just for the drama but also in rare moments of expressive beauty where Scott Graham’s movement comes beautifully into play. They’re supported by an excellent company: Philip McGinley’s kindly visitor and Martin Marquez’s brutish husband tug the conflicted Lizzie between them (and Duff is brilliant here); Ford’s Lydia struggles to find a home for her affections between Lloyd Hutchinson’s disinterested husband and Johnny Gibbon’s son who has escaped for college; and the marvelously possessed Minnie, a striking Brealey, deals wonderfully with the trials of Susan Brown’s amusing interfering mother-in-law (“Marriage is like a mousetrap for either man or woman. You soon come to the end of the cheese”), Matthew Barker’s brother-in-law and Joe Armstrong (her erstwhile partner in Constellations) as husband Luther. Perhaps inevitably it sprawls a little and I did find the miming somewhat distracting (if we can have a plate and a fork and a tin, why no apricots), but I enjoyed Husbands and Sons a lot, not least for its empathetic foregrounding of the lives of working-class women.